3500 Series Hard Plastic Tablet-Arm Chair Desks save floor space while supplying an ample work surface. These tablet arm desks offer an excellent balance of durability, convenience and value. These chair desks are sturdily constructed using high-quality materials. Their 16-gauge chrome-plated steel frames support 5/8"-thick hard-plastic chair seats. Hard plastic desk surfaces resist dents, scratches and stains, and are impervious even to sharp objects such as pen points. 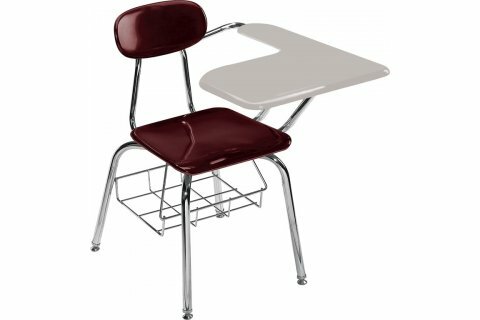 In addition to being an excellent value for schools, these combo desks are also great for students. Their extra-large tablet arms provide a generous amount of work-space. Convenient under-desk book baskets are perfect for storing notebooks, extra paper, or anything else that students want to keep within easy reach. 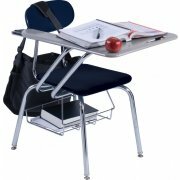 Purchase Academia chair-desks for unbeatable quality and value. Tough:16-gauge steel frame with 14-gauge steel back supports. Desktop is supported by twin 14-gauge tubular steel brace. Super-Durable Desktop: Hard plastic surface resists dents, stains and scratches, even from sharp items like pens. Space Saver: Combo desks maximize floor space. Strong Seats: Chair constructed from 5/8"-thick hard plastic. Ample Workspace: Large trapezoidal writing surface gives students plenty of room for reading and writing. Main area of worksurface is 19"W x 14"D.
Convenient Storage:Attached bookbasket offers easy access to notebooks, papers, and textbooks.